I tried to attach a photo of syringe/steroids and the "No No" filter blocked it. Probably a good thing. Yes. That is definitely a problem for 100lb speakers. I drove to Brooklyn last year for thanksgiving. Thinking about going again. I want bass as close to 30hz(or lower) as possible and HUGE dynamics. I just want gigantic speakers. The RF-83s are the tallest and are specd down to 29hz, and the KLF-30 and CF-4 are both giant blocks of sonic doom. What size room will you have them in? You know that the KLF has the glue problem, which can be fixed and the CF had the no replacement parts problem. There's a large difference in the area of woofer between the three 8" or two 12" woofers. Too bad! I lived in Denver for 23 years. I have C3s that will be going on the market soon. But, now I'm in central Illinois. Timing is everything or in this case nothing I guess. I've had both in the same room at the exact same time. 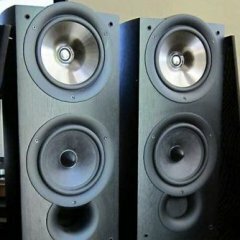 (KLF-10's too) They sound very similar, but the KLF 30's do sound bigger with more weight in the bass. Both play about the same in terms of frequency response. Some feel the 20's have "quicker" bass response. I would go for either if you can find them locally. Test all KLF's with some frequency sweeps and you'll hear the rattle of the cabinets if they have loose panels. I think the RF-83's will definitely fit the bill. 100db/w, 29hz, taller and deeper than the others(more cabinet volume) and I like the aluminum woofers. I'd prefer the KLF-30s over the CF-4s by a small margin, but I guess it's just a matter of whatever comes up first. I don't think I'd be happy with CF-3s, and I'm kinda iffy about going from P17s to KLF-20s too. Probably just continue my hunt for one of the three flagships. I would say the KLF - 30 or the Chorus II still have both pair w the KLF's as rear. Okay, some KLF-30s popped up in the Denver area. Priced a little high, but look to be in very good condition. Going to see them this afternoon! If they don't have loose panels, it would be hard for me to walk away from a pair that pristine! Good luck! never mind just saw your for sale thread. The RF-83's are black. I would consider selling. Price would be $1,000. Depending on your location I do travel around the Tristate quite often. If we want big sound we get big speakers. That includes driver and cabinet size. I like subs as good as the next guy, but bigger is just better to me at least. 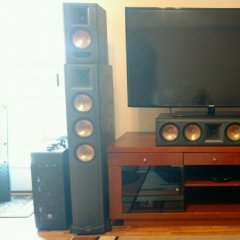 I have owned many Klipsch, they struggle with powerful bass, imo.